MomSelect clued me in to an easy way to help raise money for Feeding America (formerly known as America's Second Harvest), the nation's leading domestic hunger-relief charity: a virtual Sandwich Swap 'n' Share program sponsored by Hellmann's and Best Foods. Together with Billy Ray Cyrus (Hannah Montana's dad! ), the venerable mayonnaise makers are encouraging Americans to share virtual sandwiches via the Sandwich Swap'n'Share Facebook application. 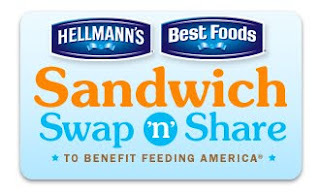 For every sandwich created as part of the virtual Sandwich Swap 'n' Share program on Facebook, Hellmann's and Best Foods will donate 7 lunches to Feeding America. If charity isn't your scene (you cold-hearted brute! ), remember that each sandwich created will automatically enter you for a chance to win a $250 grocery store gift certificate. Do-gooders and social media addicts alike can feel good knowing that for every friend on Facebook that you share your sandwich with, Hellmann's and Best Foods will donate an additional 7 lunches to Feeding America. Not a bad trade-off for a few clicks of the mouse. My sandwich is called the Grilled Yumness and includes a bunch of grilled peppers and sausages on focaccia, plus Hellman's Mayonnaise Dressing With Extra Virgin Olive Oil, which is my condiment of choice. By posting about the Sandwich Swap'n'Share program for MomSelect, I am eligible to win a $250 grocery store gift certificate and a 6-month supply of mayonnaise. Just so you know. A 6 month supply of mayonnaise! Ok, not so exciting because that would mean about 1/4 of a jar for me.